Mashed potatoes are comfort. They are smooth, creamy and soft. They are the perfect foil for gravy. They are perfect baby food and potatoes have a good amount of both potassium and vitamin C. Health and comfort…does it get much better than that? It does, because these mashed potatoes don’t have any added fat in them…these are guiltless. We love mashed potatoes. Potatoes were the base for most of the foods I fed The Sons when they were babies. They have wonderful minerals (the potatoes, not The Sons), are high in Vitamin C and potassium…win-win! To this day, The Sons get a rather dreamy look in their eyes when they know there will be mashed potatoes. And Mother’s Pot Roasted Perfection, with its fantastic gravy, made by The Middle Child, is perfection indeed. My sister, The Dietitian, is a great cook. Many years ago she was helping me with dinner and offered to do the mashed potatoes. She didn’t add milk or cream, but instead, used the water the potatoes cook in. I thought she’d lost it completely, but they were wonderful. Not only do you knock huge amounts of calories out of the mashed potatoes, you add a heap of the nutrients that would be poured down the drain, back into the potatoes and, did I mention, they taste great! You really taste the purity of the potato. You have to try this. Remember, the gravy? Now you can eat more without feeling guilty. I don’t know that you actually need a recipe for mashed potatoes, but here it is anyway…more or less! You’re going to need a large pot. Fill it half full of cold water; set aside. Cut the peeled potatoes (though you really don’t need to peel them if you don’t mind the peelings in the finished product) into large-ish chunks. For tennis ball sized potatoes, I usually cut them in half. Place the potatoes in the pot, as you finish peeling and cutting them into chunks. Add the salt and garlic cloves and place the pot on the burner over high heat. DO NOT COVER, or the water will boil over. You may partially cover it, though. Once the water boils, lower the heat to maintain a good boil. Cook until the potatoes can be easily pierced with a fork (using a fork is more accurate than a knife, which slides in more easily). Five pounds take about 20-25 minutes to cook, but make sure you check them after 15 minutes. When they are tender, drain them, being very careful to keep the garlic cloves in the pot; you’re going to mash them right into the potatoes. RESERVE the potato water in a large bowl. I use an 8 cup measuring cup. Place the pot with the drained potatoes on a flat surface and mash with a potato masher or put through a potato ricer (ricing them will make a fluffier “mashed” potato). 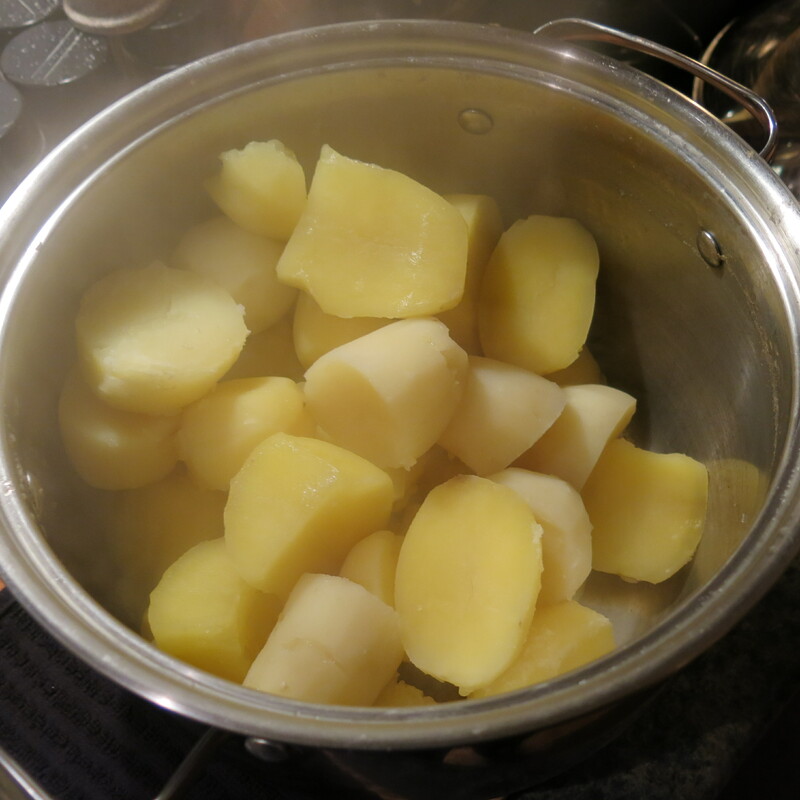 Now, begin to add some of the hot potato water back into the potatoes, mashing and whipping as you add the water. Add it in incremental amounts so you don’t end up with soupy mashed potatoes. Whip in the remaining ingredients, taste and correct the seasoning. Make Ahead: You can mash the potatoes up to an hour ahead of time, cover and let stand. They hold the heat well, but if you need to reheat them, put the pot back on the burner over low heat, stirring every now and then until they are hot. 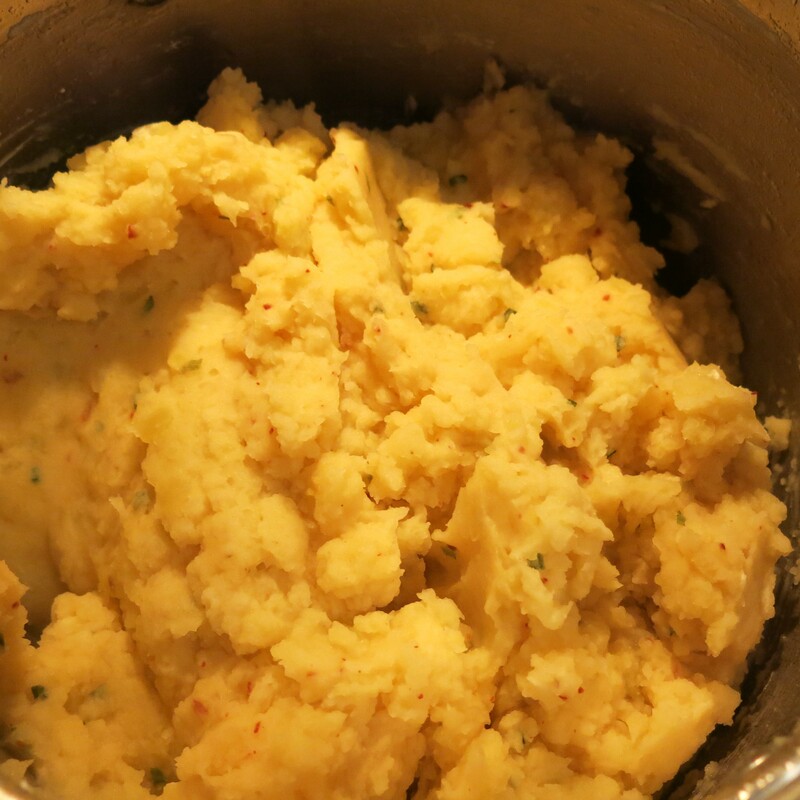 Mashed Potato Perfection Recipe©Marcia Lahens 2014. All Rights Reserved. When the potatoes are tender, remove the pot from the burner, cover and very, very carefully drain, reserving the water; watch the steam, as it can burn you in seconds. Remember to keep the garlic cloves in with the potatoes. Mash or rice the potatoes until most of the lumps are out of them. I don’t ever use a mixer, as you can end up with some pretty gooey potatoes. Personally I don’t care if there are a few small lumps; I think it adds character. Hell, I have more than a few small lumps and I’m loaded with character! Add the chives, garlic granules, pepper flakes, if using and more kosher salt. If you are using sea salt, use less than indicated. Whip the whole thing together until combined. At this stage, I still needed to add more of the water. NOW, if you feel the need, add a chunk of butter, may 1/4 cup of room temp butter. Or you can add some warmed sour cream. It’s up to you, but if you are serving gravy, you really don’t need to add anything else. You have made Mashed Potato Perfection. Life is good and so is dinner. 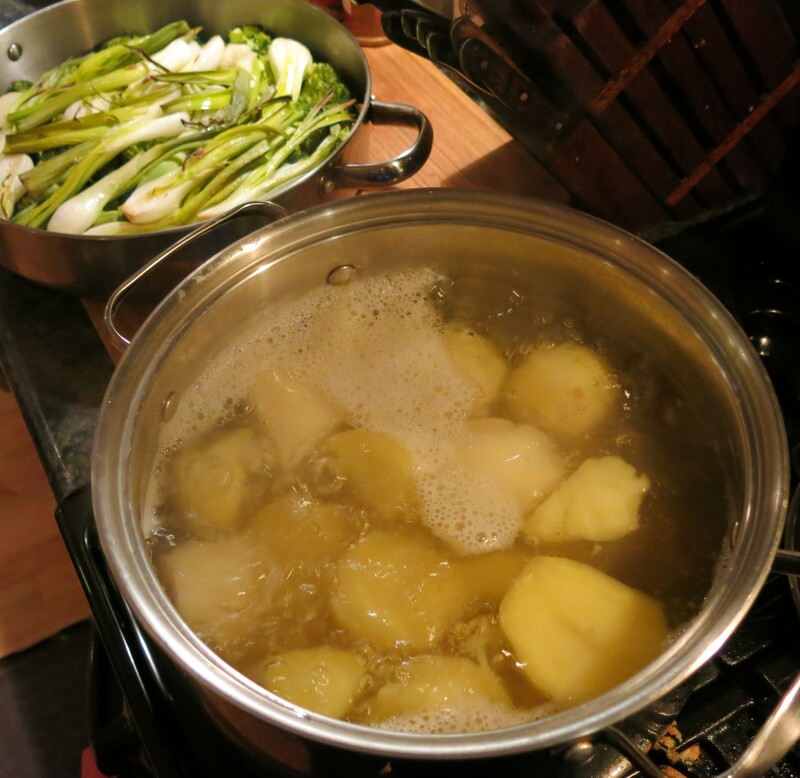 I boil my unpeeled yukon gold or red potatoes right in the dairy (milk & half & half) with butter, garlic and grill seasoning. 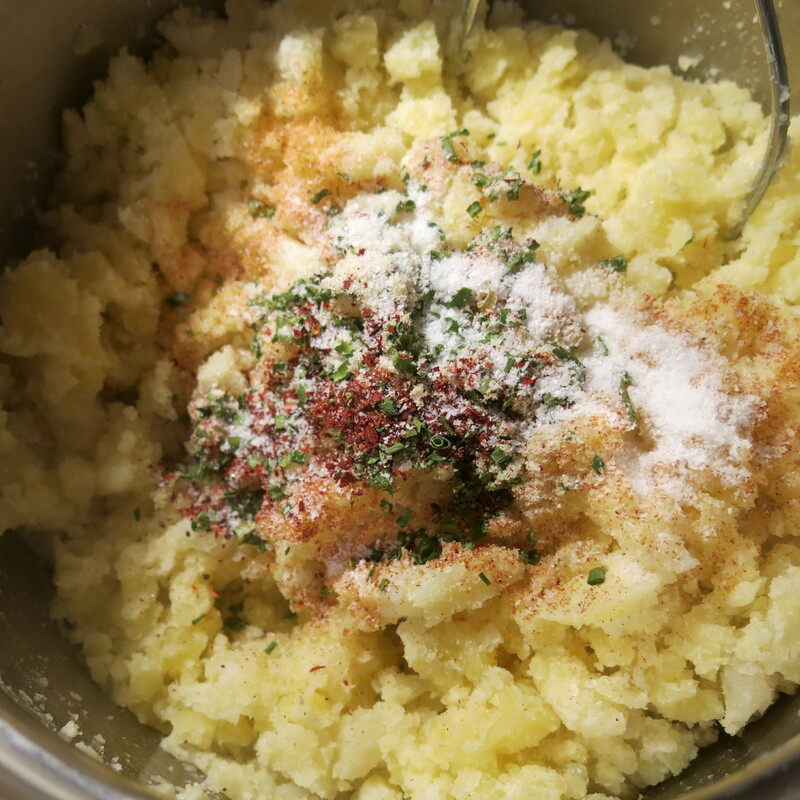 When the potatoes are done I just whip them up in the same pot with a hand mixer or immersion blender and if necessary tighten them up with potato granules. One pot potato bliss! This is a great idea…one pot bliss indeed!